After reaching Delhi he got roles in Short Films in Doordarshan that were aired then like, Nazare Darmiyan hai, Chhoti Si Bhool, Aankhen and Dambh. He also did more than 7000 shows for All India Radio. 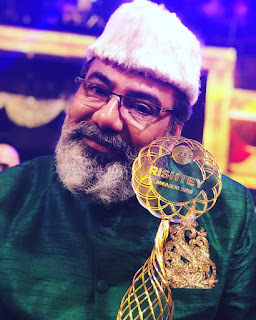 Due to his enthralling voice he won the award of best Voice Over from Aakashvani twice. After these achievements he was still hungry for more and moved to P7 News as Crime Anchor and Producer for 5 years. Yet his desires were not quenched so in search for more he moved to Mumbai in 2015. Due to his remarkable performances in the past it did not take much time for him to settle in. He soon got roles in Daily Soap operas like Ek Vivah Aisa Bhi where he played the role of Tauji aired on &TV, Sankatmochan Hanuman as Maayasur on Sony, Chandrasekhar as Kishan Singh on Star Bharat, Battle of Saragadhi as father of Ishar Singh on Discovery Jeet, Majha Navrachi Bayko as Mr. Kapoor in Zee Marathi and currently on air show Ishq Subhan Allah as Quazi Irfan Siddiqui on Zee TV for which he won award of favourite father at Zee Rishtey Awards. Quazi is playing a wonderful role as a father. I always pray for his success in life. Congratulations sir, this Award is the evidence of your hard work and passion towards acting. Great work pushkarna ji. We all are proud of you. Only it was a matter of time to be recognized. You are real hero of islam that made islam so easy to understand .I never thought that a show made islam so easy.you give a new way or a new path through this show.i never seen a artist like you.you deserve this award infact only you deserve this . I dont have words to describe you .You are my abba.i love you. The journey from Gorakhpur to Mumbai was really very long and tough.However it,s never late.You deserve this and made it.congratulations.wish you many more achievements.Stay blessed. Awesome Sir Ji😊 God bless you with more and more sucess. You deserve it👍..!! 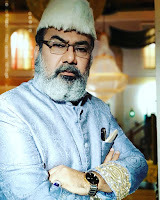 Congratulations sir for the best father award .Really you are doing great job for the serial ishq Subhan Allah .you are character is muslim in the serial but you are looking muslim in real life due to beared and kurta and cap . You are so good sir please keep going inshallah you achieve a lot of success in your life .May allah fullfill you requirements. Suneel Pushkarna, an artist from the gross root paved his path himself and shown light to budding artists by many great theatrical performance. The journey still continues. His ethical commitment and dedication will bring many more examplary great performance as he is still hungry and thirsty. Not only a great artist, a humble and a good human being of values, Mr. Pushkarna deserves much more. I heartily congratulate him for fetching Rishtey award. I hope that he will break the new horizons, as he usually does, very soon. It is a success, you truly deserved this award. It is an achievement you have earned. I congratulate you on your success and wish you all the best for your future. Firstly congrats sir... u desrved it... such a great artist... U always give mind blowing performance in every serial Bt in this serial u define islam very easily..
Congrats uncle on this great achievement ! Many more to collect to fancy your shelves in the coming years .. Best of luck for the future!